"This is a great alternative to a cold pasta salad as farro doesn't get soggy and holds up to the dressing very well. 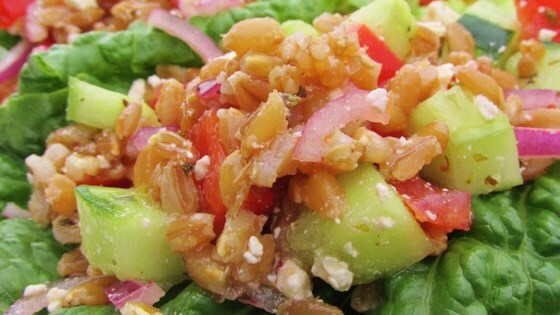 Farro is an ancient Mediterranean grain, so I wanted to merge it with a Greek-style salad that's perfect for summertime. This is great served with grilled lamb or chicken. Add black olives or fresh herbs to your liking!" Rinse farro with water; drain. Place farro in a pot; pour in chicken broth to cover farro by at least one inch, adding water if needed. Stir in 1 teaspoon olive oil and sea salt. Bring liquid to a boil; reduce heat to medium and simmer, uncovered, stirring frequently, until tender, about 35 minutes for whole grain farro or about 20 minutes for pearled farro. Drain farro, rinse with cold water, and set aside to cool completely, about 15 minutes. Whisk 1/4 cup extra-virgin olive oil, lemon juice, Greek seasoning, and garlic together in a large bowl. Stir in tomato, cucumber, red pepper, red onion, and feta cheese. Stir farro into tomato mixture until completely coated with dressing; season with salt and pepper. Refrigerate salad for about 2 hours before serving. Farro may be whole-grain, or pearled (perlato) with part or all of the outer coating removed. For more specific cooking times, see package directions. Vegetable broth can be used in place of the chicken broth. Add a 1/4 cup of chopped fresh herbs of your choosing like mint, cilantro or dill. The farro might soak up some of the lemon juice and oil, so you may need more dressing after it sits in the fridge for a day or two. I like to add half of a used lemon to the farro while cooking; after 5 minutes most of the lemon oils are used up and it can be tossed out. Some of the acidity from the lemon helps open up the husks if you are using whole grain farro. For a nice presentation, serve on lettuce leaves and sprinkle with fresh herbs. Really robust and flavorful. This would take very well to having kale added. This is an excellent side dish. So good when tomatoes are in season!! I added some Greek olives. Delicious! Great hot or cold, by itself or as a side, as a meal or as a snack.